We are a wholesale supplier of ingredients for the cosmetics and toiletries, personal care, spa and wellness industries. Our mission is to bring nature and science together to offer the best in innovative, natural source products. The Herbarie is built around our commitment to quality and ethics, a responsibility to the environment, and the best in customer service. We are passionate about what we do and we strive to share this passion with our customers. 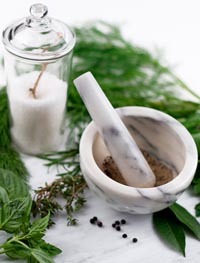 The Herbarie offers a full selection of ingredients for making cosmetics and toiletries. Most of our products are based on natural ingredients, such as shea butter, jojoba oil, sunflower seed extract, rose water, herbs and other botanicals. We are pleased to offer this selection of naturally derived bulk ingredients from which you can create your own personal care products. Our raw materials include, botanical extracts and botanical complexes, distillates and hydrosols, dried botanicals, hydrolyzed proteins, emulsifiers, emollients, conditioners and thickeners, oils and butters, and essential oils for making both skin care and hair care products. We specialize in botanical extracts and botanical complexes which include antioxidants and anti-aging products. The Herbarie also specializes in making shampoo and making shower and bath products. We offer the best of the ultra-mild surfactants and surfactant concentrates for making shampoo and shower gel. The Herbarie also offers cosmetic active ingredients, cosmetic anti-aging ingredients, cosmetic preservatives and other ingredients to make your own handcrafted personal care products and cosmetics. We provide technical assistance and information on all products from The Herbarie and offer a Formulary to provide additional guidance for working with the raw materials we sell. The Herbarie Formulary is designed to provide basic information, creative ideas, and guidance to formulators in the cosmetics and toiletries, personal care, and spa industries. Our free online formulas range from simple to complex to meet the needs of both the beginning and experienced formulator. We hope you will enjoy using them to make your own handcrafted cosmetics and toiletries and other personal care products. Our Library includes helpful and interesting information, such as formulating tips on making your own products, useful links to other websites, and ingredient information. Our free email newsletter, The Herbarie Update, includes product updates, new formulas, formulating tips and special sales. Our Sales and Shipping Policies will help you understand how we do business. Please feel free to contact us if you have any questions. We hope you enjoy your visit to The Herbarie!